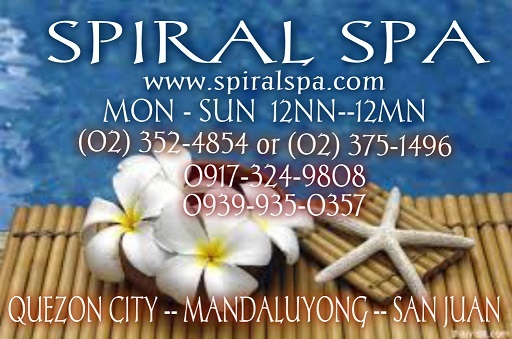 Spiral Spa has a select range of home spa services available in Quezon City, Ortigas, San Juan, Pasig City and other nearby cities.We can offer home service Manicure Pedicure, Ear Candling, Foot Spa and Foot Reflexology.Our therapist are experienced in providing for clients personal care and beauty needs.We also have a large range of massage packages available. You will find our therapist friendly, professional and well trained so you get the best home service spa experience. Enjoy a relaxing Foot Spa with all the benefits of Foot Reflexology.A great way to improve your health and well being.Or have your hands and feet looking great with our Manicure and Pedicure.Which ever you choose you are sure to feel the benefits.